This article is about the institution of the Ecumenical Patriarchate, the Eastern Orthodox Church of Constantinople. For the office of the patriarch, see Ecumenical Patriarch of Constantinople. "Patriarchate of Constantinople" redirects here. For other patriarchates that have historically resided in the city, see Latin Patriarchate of Constantinople and Armenian Patriarchate of Constantinople. The Ecumenical Patriarchate of Constantinople (Greek: Οἰκουμενικόν Πατριαρχεῖον Κωνσταντινουπόλεως, Oikoumenikón Patriarkhíon Konstantinoupóleos, IPA: [ikumeniˈkon patriarˈçion konstandinuˈpoleos]; Latin: Patriarchatus Oecumenicus Constantinopolitanus; Turkish: Rum Ortodoks Patrikhanesi, "Roman Orthodox Patriarchate") is one of the fifteen autocephalous churches (or "jurisdictions") that together compose the Eastern Orthodox Church. It is headed by the Ecumenical Patriarch of Constantinople, currently Bartholomew I, Archbishop of Constantinople. Because of its historical location as the capital of the former Eastern Roman (Byzantine) Empire and its role as the Mother Church of most modern Orthodox churches, Constantinople holds a special place of honor within Orthodoxy and serves as the seat for the Ecumenical Patriarch, who enjoys the status of Primus inter pares (first among equals) among the world's Eastern Orthodox prelates and is regarded as the representative and spiritual leader of the world's 300 million Orthodox Christians. The Ecumenical Patriarchate promotes the expansion of the Christian faith and Orthodox doctrine, and the Ecumenical Patriarchs are involved in ecumenism and interfaith dialogue, charitable work, and the defense of Orthodox Christian traditions. Prominent issues in the Ecumenical Patriarchate's policy in the 21st century include the safety of the believers in the Middle East, reconciliation of the Eastern Orthodox and Catholic Churches, and the reopening of the Theological School of Halki which was closed down by the Turkish authorities in 1971. Christianity in Byzantium existed from the 1st century, but it was in the year 330 that the Roman Emperor Constantine the Great moved his residence to the small Greek town of Byzantium, renaming it Nova Roma. From that time, the importance of the church there grew, along with the influence of its bishop. Prior to the moving of the imperial capital, the bishop of Byzantium had been under the authority of the metropolitan of Heraclea, but beginning in the 4th century, he grew to become independent in his own right and even to exercise authority throughout what is now Greece, Asia Minor, Pontus, and Thrace. With the development of the hierarchical structure of the Church, the bishop of Constantinople came to be styled as exarch (a position superior to metropolitan). Constantinople was recognized as the fourth patriarchate at the First Council of Constantinople in 381, after Antioch, Alexandria, and Rome. The patriarch was usually appointed by Antioch. Because of the importance of the position of Constantinople's church at the center of the Roman Empire, affairs involving the various churches outside Constantinople's direct authority came to be discussed in the capital, particularly where the intervention of the emperor was desired. The patriarch naturally became a liaison between the emperor and bishops traveling to the capital, thus establishing the position of the patriarch as one involving the unity of the whole Church, particularly in the East. In turn, the affairs of the Constantinopolitan church were overseen not just by the patriarch, but also by synods held including visiting bishops. This pan-Orthodox synod came to be referred to as the ενδημουσα συνοδος (endimousa synodos, "resident synod"). The resident synod not only governed the business of the patriarchate but also examined questions pertinent to the whole Church as well as the eastern half of the old empire. The patriarch thus came to have the title of Ecumenical, which referenced not a universal episcopacy over other bishops, but rather the position of the patriarch as at the center of the oikoumeni, the "household" of the empire. As the Roman Empire stabilized and grew, so did the influence of the patriarchate at its capital. This influence came to be enshrined in Orthodox canon law, to such an extent that it was elevated even beyond more ancient patriarchates: Canon 3 of the First Council of Constantinople (381) stated that the bishop of that city "shall have primacy of honor after the Bishop of Rome because Constantinople is the New Rome." In its disputed 28th Canon, the Council of Chalcedon in 451 recognized an expansion of the boundaries of the Patriarchate of Constantinople and of its authority over bishops of dioceses "among the barbarians", which has been variously interpreted as referring either to areas outside the Byzantine Empire or to non-Greeks. The council resulted in a schism with the Patriarchate of Alexandria. In any case, for almost a thousand years the Patriarch of Constantinople presided over the church in the Eastern Roman (Byzantine) Empire and its missionary activity that brought the Christian faith in its Byzantine form to many peoples north of the imperial borders. The cathedral church of Constantinople, Hagia Sophia (Holy Wisdom), was the center of religious life in the eastern Christian world. The Ecumenical Patriarchate came to be called the "Great Church of Christ" and it was the touchstone and reference point for ecclesiastical affairs in the East, whether in terms of church government, relations with the state, or liturgical matters. In the eighth and ninth centuries the iconoclast movement caused serious political unrest throughout the Empire. The emperor Leo III issued a decree in 726 against images, and ordered the destruction of an image of Christ over one of the doors of the Chalke, an act which was fiercely resisted by the citizens. 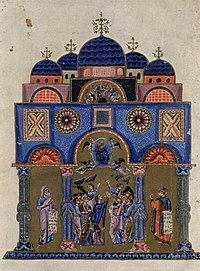 Constantine V convoked a church council in 754 which condemned the worship of images, after which many treasures were broken, burned, or painted over with depictions of trees, birds or animals: one source refers to the church of the Holy Virgin at Blachernae as having been transformed into a "fruit store and aviary". Following the death of his son Leo IV in 780, the empress Irene restored the veneration of images through the agency of the Second Council of Nicaea in 787. Most of the direct causes of the Great Schism, however, are far less grandiose than the famous Filioque. The relations between the papacy and the Byzantine court were good in the years leading up to 1054. The emperor Constantine IX and the Pope Leo IX were allied through the mediation of the Lombard catepan of Italy, Argyrus, who had spent years in Constantinople, originally as a political prisoner. Patriarch Michael I ordered a letter to be written to the Bishop of Trani in which he attacked the "Judaistic" practices of the West, namely the use of unleavened bread. The letter was to be sent by John to all the bishops of the West, including the Pope. John promptly complied and the letter was passed to Humbert of Mourmoutiers, the cardinal-bishop of Silva Candida, who translated the letter into Latin and brought it to the Pope, who ordered a reply to be made to each charge and a defence of papal supremacy to be laid out in a response. Although he was hot-headed, Michael was convinced to cool the debate and thus attempt to prevent the impending breach. However, Humbert and the pope made no concessions and the former was sent with legatine powers to the imperial capital to solve the questions raised once and for all. Humbert, Frederick of Lorraine, and Peter, Archbishop of Amalfi arrived in April 1054 and were met with a hostile reception; they stormed out of the palace, leaving the papal response with Michael, who in turn was even more angered by their actions. The patriarch refused to recognise their authority or, practically, their existence. When Pope Leo died on April 19, 1054, the legates' authority legally ceased, but they effectively ignored this technicality. In response to Michael's refusal to address the issues at hand, the legatine mission took the extreme measure of entering the church of the Hagia Sophia during the Divine Liturgy and placing a bull of excommunication on the altar. The events of the East-West Schism are generally dated from the acts of 1054. However, these events only triggered the beginning of the schism. The full schism was not actually consummated by the seemingly mutual excommunications. The New Catholic Encyclopedia reports that the legates had been careful not to intimate that the bull of excommunication implied a general excommunication of the Byzantine Church. The bull excommunicated only Caerularius, Leo of Achrida, and their adherents. Thus, the New Catholic Encyclopedia argues that the dispute need not have produced a permanent schism any more than excommunication of any "contumacious bishop". The schism began to develop when all the other Eastern patriarchs supported Caerularius. According to the New Catholic Encyclopedia, it was the support of Emperor Michael VI Stratiotikos that impelled them to support Caerularius. Some have questioned the validity of the bull on the grounds that Pope Leo IX had died at that time and so the authority of the legates to issue such a bull is unclear. The legates left for Rome two days after issuing the bull of excommunication, leaving behind a city near riot. The patriarch had the immense support of the people against the emperor, who had supported the legates to his own detriment. To assuage popular anger, the bull was burnt, and the legates were anathematised. Only the legates were anathematised and, in this case too, there was no explicit indication that the entire Western church was being anathematised. In the bull of excommunication issued against Patriarch Michael by the papal legates, one of the reasons cited was the Eastern Church's deletion of the "Filioque" from the original Nicene Creed. In fact, it was precisely the opposite: the Eastern Church did not delete anything. It was the Western Church that added this phrase to the Nicene-Constantinopolitan Creed. "Even after 1054 friendly relations between East and West continued. The two parts of Christendom were not yet conscious of a great gulf of separation between them. … The dispute remained something of which ordinary Christians in East and West were largely unaware". In fact, efforts were made in subsequent centuries by Popes and Patriarchs to heal the rift between the churches. However, a number of factors and historical events worked to widen the separation over time. The Fourth Crusade in agreement for funds attempted to help the deposed emperor Alexius IV regain his throne. After taking Constantinople, returning Alexius IV to the throne, the revolt against and death of Alexius IV, the Crusaders were left without payment. On 12 April 1204, the crusaders inflicted a severe sacking on Constantinople for three days, during which many ancient and medieval Roman and Greek works were either stolen or destroyed. Despite their oaths and the threat of excommunication, the Crusaders ruthlessly and systematically violated the city's holy sanctuaries, destroying, defiling, or stealing all they could lay hands on; nothing was spared. It was said that the total amount looted from Constantinople was about 900,000 silver marks. The Venetians received 150,000 silver marks that was their due, while the Crusaders received 50,000 silver marks. A further 100,000 silver marks were divided evenly up between the Crusaders and Venetians. The remaining 500,000 silver marks were secretly kept back by many Crusader knights. "The Latin soldiery subjected the greatest city in Europe to an indescribable sack. For three days they murdered, raped, looted and destroyed on a scale which even the ancient Vandals and Goths would have found unbelievable. Constantinople had become a veritable museum of ancient and Byzantine art, an emporium of such incredible wealth that the Latins were astounded at the riches they found. Though the Venetians had an appreciation for the art which they discovered (they were themselves semi-Byzantines) and saved much of it, the French and others destroyed indiscriminately, halting to refresh themselves with wine, violation of nuns, and murder of Orthodox clerics. The Crusaders vented their hatred for the Greeks most spectacularly in the desecration of the greatest Church in Christendom. They smashed the silver iconostasis, the icons and the holy books of Hagia Sophia, and seated upon the patriarchal throne a whore who sang coarse songs as they drank wine from the Church's holy vessels. The estrangement of East and West, which had proceeded over the centuries, culminated in the horrible massacre that accompanied the conquest of Constantinople. The Greeks were convinced that even the Turks, had they taken the city, would not have been as cruel as the Latin Christians. The defeat of Byzantium, already in a state of decline, accelerated political degeneration so that the Byzantines eventually became an easy prey to the Turks. The Crusading movement thus resulted, ultimately, in the victory of Islam, a result which was of course the exact opposite of its original intention. "(Vryonis, Byzantium and Europe, p.152). During this era, Roman Catholic-Orthodox relations were at their lowest point, and the retaliation during the Massacre of the Latins would solidify the severed ties from the Great Schism that would divide Christianity on a level that would be unseen until the Protestant Reformation. When Pope Innocent III heard of the conduct of his pilgrims, he was filled with shame and strongly rebuked the crusaders. Meanwhile, the Latin Empire of Constantinople was established, and Byzantine refugees founded their own successor states, the most notable of these being the Empire of Nicaea under Theodore Lascaris (a relative of Alexius III), the Empire of Trebizond, and the Despotate of Epirus. The new seat of the Patriarchate was established in the city of Nicaea until in 1261, when Constantinople was reconquered by the Byzantine Emperor Michael VIII Palaiologos. After Constantinople was overrun by the Ottoman Turks in 1453, the Patriarchate came to care more directly for all the Orthodox living in the Ottoman Empire. Mehmed II appointed Gennadios II Scholarios as the Patriarch in 1454 and designated him as the spiritual leader as well as the ethnarch or, in Turkish, milletbashi of all the Orthodox Christians in the Empire, regardless of ethnic origin; not only Greeks, but also Bulgarians, Serbs, Albanians, Wallachians, Moldavians, Croatis, Syrians, orthodox Arabs, Georgians and Lazs came under the spiritual, administrative, fiscal, cultural and legal jurisdiction of the Patriarchate. Some of the other patriarchs came at various points to live permanently in Constantinople and function as part of the local church government. This situation, according to some of the Orientalists and historians, shows the Pax Ottomana or Pax Ottomanica (literally "the Ottoman Peace"). The Russian Orthodox Church, which for centuries had been a diocese of the Ecumenical Patriarchate, declared its independence in 1448, shortly before Constantinople fell, owing to its protest over the Council of Florence, in which representatives of the patriarchate had signed onto union with Rome, trading doctrinal concessions for military aid against the encroaching Ottomans. The military aid never came, and those concessions were subsequently repudiated by the patriarchate, but from 1448, the Russian church came to function independently. Within decades after the Fall of Constantinople to Mehmed II of the Ottoman Empire on 29 May 1453, some were nominating Moscow as the "Third Rome", or the "New Rome". 141 years later, in 1589, Constantinople came to recognize Russia's independence and led the Orthodox Church in declaring Russia also to be a patriarchate, numbering Moscow's bishop as fifth in rank behind the ancient patriarchates. The Russian Orthodox Church became the largest of the Eastern Orthodox churches in the world. As Ottoman rule weakened, various parts of the Orthodox Church that had been under the direct influence of the Ecumenical Patriarchate came to be independent. These churches at first usually declared their independence without universal approval, which came after Constantinople gave its blessing. The rate at which these new autocephalous ("self-headed") churches came into being increased in the 19th century, particularly with the independence of Greece. Saint Peter's Gate at the Patriarchate. In 1821, Patriarch Gregory V remained hanged in full robes for three days at its architrave, because he was blamed by Mahmud II for his inability to suppress the Greek War of Independence. The Gate has not been opened since. In 1833, the Church of Greece declared its autocephaly, which was subsequently recognized by the patriarchate in 1850. In 1865, the Romanian Orthodox Church, against the protests of Constantinople, declared its independence, which was acknowledged in 1885. A year before Greece's autocephaly was self-proclaimed, the Serbian Orthodox Church was named autocephalous by the local secular government, and Constantinople refused recognition until 1879. In 1860 the Bulgarians de facto seceded from the Great Church and in 1870 the Bulgarian church was politically recognized as autonomous under the name Bulgarian Exarchate by the Sultan's firman, although it was not until 1945 that it was recognized by the Ecumenical Patriarchate. In 1922, the Albanian Orthodox Church declared its autocephaly, being granted recognition of it in 1937. In addition to these churches, whose territory had been agreed upon by all as within Constantinople's jurisdiction, several other disputed areas' Orthodox churches have had recognition by the Ecumenical Patriarchate as either autocephalous or autonomous, including the Finnish Orthodox Church and Estonian Orthodox Church in 1923, the Polish Orthodox Church in 1924, the Czech and Slovak Orthodox Church in 1998. The majority of these disputes are a result of the expansion of the Russian Empire, which often included a subjugation of the Orthodox churches in conquered lands to the Moscow Patriarchate. Due to this, the Moscow Patriarchate often disputes the Ecumenical Patriarch's role as prime representative and spiritual leader of the world's Orthodox Christians, citing that it represents the numerically largest Orthodox community. As a ruling institution, the Ottoman Empire brought regulations on how the cities would be built (quality reassurances) and how the architecture (structural integrity, social needs, etc.) should be shaped. Special restrictions were imposed concerning the construction, the renovation, the size and the usage of the bells in churches. For example, in a town a church should not be larger in size than the largest mosque. Some churches were destroyed (e.g. the Church of the Holy Apostles), many were converted into mosques (among them the Hagia Sophia and Chora Church in Constantinople, the Rotunda and Hagios Demetrios in Thessaloniki) or served for other uses (e.g. Hagia Irene in Constantinople, which became an armory for the Janissaries, and the Gül Mosque (Hagia Theodosia or Christ Euergetes), also in Constantinople, which after the Conquest served for a while as a naval dockyard). Must also be pointed out that such rules, very strict in the beginning, with time and the increasing importance reached in the Ottoman Empire by the Rûm Millet, were more and more disregarded, so that in the 19th century in Istanbul there was a veritable building boom of Orthodox churches, many among them having high bell towers and brick domes, which previously were both strictly prohibited. The exterior of the Patriarchal Basilica of St. George located in the Fener district of Istanbul. The facade dates from the mid-19th century and shows a neo-Classical influence. The current Ecumenical Patriarch, Bartholomew I. Since 1586 the Ecumenical Patriarchate has had its headquarters in the relatively modest Church of St George in the Fener (Phanar) district of Istanbul. The current territory of the Patriarchate is significantly reduced from what it was at its height. Its canonical territory currently includes most of modern Turkey, northern Greece and Mount Athos, the Dodecanese and Crete. By its interpretation of Canon 28 of Chalcedon, Constantinople also claims jurisdiction over all areas outside the canonically defined territories of other Orthodox churches, which includes the entire Western hemisphere, Oceania, the United Kingdom, Western Europe, Northeast Asia, Southeast Asia, and elsewhere. This claim is disputed by other autocephalous churches with diocese in those areas, as well as the Turkish government. The Orthodox presence in Turkey itself is small; however the majority of Orthodox in North America (about two-thirds) are under the Ecumenical Patriarchate, primarily in the Greek Orthodox Archdiocese of America. The Patriarchate also enjoys an even greater majority in the United Kingdom. Furthermore, the Albanian, Rusyn and Ukrainian jurisdictions in America are also part of the Patriarchate. Most of the Patriarchate's funding does not come directly from its member churches but rather from the government of Greece, due to an arrangement whereby the Patriarchate had transferred property it had owned to Greece. In exchange, the employees, including the clergy, of the Patriarchate are remunerated by the Greek government. The Greek Orthodox Archdiocese of America provides substantial support through an annual contribution, known as the logia, and its institutions, including the American-based Greek Orthodox Ladies Philoptohos Society and the Archons of the Ecumenical Patriarchate, usually important laymen who make large donations for the upkeep of the Patriarchate. In turn, they are granted honorary titles which once belonged to members of the Patriarchal staff in centuries past. The Patriarchate acts in the capacity of being an intermediary and facilitator between the Orthodox churches and also in relations with other Christians and religions. This role sometimes brings the Patriarchate into conflict with other Orthodox churches, as its role in the Church is debated. The question centers around whether the Ecumenical Patriarchate is simply the most honored among the Orthodox churches or whether it has any real authority or prerogatives (presveia) which differ from the other autocephalous churches. This dispute is often between Constantinople and Moscow, the largest Orthodox church in terms of population, especially as expressed in the Third Rome theory which places Moscow in the place of Constantinople as the center of world Orthodoxy. Such disputes sometimes result in temporary breaks in full communion, though usually not for very long. The relationship between Constantinople and the Ottoman Empire was frequently bitter, due in no small part to the privilege given to Islam. In the secular Republic of Turkey, tensions are still constant. Turkey requires by law that the Patriarch be a Turkish citizen by birth, which all Patriarchs have been since 1923, though they are all ethnic Greeks from the minuscule and steadily decreasing Greek minority of Turkey which is causing a shortage of priests and consequently potential candidates for the post of Ecumenical Patriarch. The state's expropriation of church property and the closing of the Orthodox Theological School of Halki are also difficulties faced by the Patriarchate. The affairs of the patriarchate are conducted by the Holy Synod, presided over by the Ecumenical Patriarch. The synod has existed since some time prior to the fourth century and assists the patriarch in determining the affairs of the possessions under his jurisdiction. The synod first developed from what was referred to as the resident synod, composed of the patriarch, local bishops, and any Orthodox bishops who were visiting in the imperial capital of Constantinople. After the fall of Constantinople, the synod's membership became limited to bishops of the patriarchate. Notable hierarchs of the Ecumenical Patriarchate are the popular writer Kallistos (Timothy) Ware, an assistant-bishop in the Archdiocese of Thyateira, and author of The Orthodox Church, the best-known introduction to the Orthodox Church in English and John Zizioulas Metropolitan of Pergamon, a well-known professor of Systematic Theology. The right of non- Turkish members of the synod (from Northern Greece, the Dodecanese, America and Western Europe) to convene appears to be threatened by a recent declaration from the Istanbul Governor reported in the Freiburg archdiocesan magazine. World jurisdictions of Orthodox Patriarchates. Head of the Patriarchate of Constantinople and of the Holy Synod is the Archbishop of Constantinople, New Rome and Ecumenical Patriarch "first among equals" and Co-Head of State of Mount Athos, Bartholomew I (Dimitrios Archontonis) (1991-). The local churches of the Ecumenical Patriarchate consist of six archdioceses, eight churches, and 18 metropolises, each of which reports directly to the Patriarch of Constantinople with no intervening authority. In addition, three of the six archdioceses have internal metropolises (17 in all), which are part of their respective archdioceses rather than distinct administrative entities, unlike the other metropolises. Two of the churches of the patriarchate are autonomous, the Finnish Orthodox Church and the Estonian Orthodox Church. Greek-Orthodox metropolises in Asia Minor, ca. 1880. The New Lands canonical territory, located in northern Greece and in the major islands in the north and northeast Aegean, became part of the modern Greek state only after the Balkan Wars. However, most of its dioceses are de facto administered as part of the Church of Greece for practical reasons (except the Dodecanese), under an agreement between the churches of Athens and Constantinople. Bulgarian Orthodox Church; autocephaly granted in 927; autocephaly re-recognized in 1235 and 1945. Russian Orthodox Church; autocephaly recognized in 1589, split again and severe cut ties from Byzantine/Constantinopolitan Orthodoxy on 15 October 2018. Church of Greece (Archdiocese of Athens and All Greece); autocephaly recognised in 1850. Serbian Orthodox Church; autocephaly granted in 1219; abolished in 1463 and 1766, re-recognized in 1557 and 1879. Romanian Orthodox Church; autocephaly recognized in 1885. Polish Orthodox Church (Warsaw); autocephaly recognised in 1924 by the Ecumenical Patriarchate of Constantinople and in 1948 by the Russian Orthodox Church. Orthodox Autocephalous Church of Albania (Archdiocese of Tirana, Durrës and All Albania); autocephaly recognised in 1937. Czech and Slovak Orthodox Church (Metropolis of Prague, Czech Lands and Slovakia); autocephaly recognised in 1951 by the Russian Orthodox Church and in 1998 by the Ecumenical Patriarchate of Constantinople. Ukrainian Orthodox Church; intention to grant autocephaly announced in 2018. Rejected by the Russian Orthodox Church. Autocephaly granted to the Orthodox Church of Ukraine on 5 January 2019. ^ a b Krindatch, Alexei (2011). Atlas of American Orthodox Christian Churches. Brookline, MA: Holy Cross Orthodox Press. p. 143. ISBN 978-1-935317-23-4. ^ Ortaylı, İlber (2003). "Osmanlı Barışı", p. 14. ISBN 975-6571-50-0. ^ In Turkey it is also referred to unofficially as Fener Rum Patrikhanesi, "Roman Patriarchate of the Phanar"
^ "The Patriarch Bartholomew". 60 Minutes. CBS. 20 December 2009. Retrieved 11 January 2010. ^ Commander opposed Halki Seminary reopening over fears Archived 2011-01-22 at the Wayback Machine Today's Zaman, 21 January 2011. ^ A. A. Vasiliev, History of the Byzantine Empire, 1952, vol I, p. 261. ^ Norwich, John J. (1967). The Normans in the South 1016-1130. p.102. ^ New Catholic Encyclopedia. ...in 1053 he [Michael Caerularius] sends off a declaration of war, then shuts up the Latin churches at Constantinople, hurls a string of wild accusations, and shows in every possible way that he wants a schism, apparently for the mere pleasure of not being in communion with the West. He got his wish. After a series of wanton aggressions, unparalleled in church history, after he had begun by striking the pope's name from his diptychs, the Roman legates excommunicated him (16 July 1054). But still there was no idea of a general excommunication of the Byzantine Church, still less of all the East. The legates carefully provided against that in their Bull. They acknowledged that the emperor (Constantine IX, who was excessively annoyed at the whole quarrel), the Senate, and the majority of the inhabitants of the city were "most pious and orthodox". They excommunicated Caerularius, Leo of Achrida, and their adherents. This quarrel, too, need no more have produced a permanent state of schism than the excommunication of any other contumacious bishop. The real tragedy is that gradually all the other Eastern patriarchs took sides with Caerularius, obeyed him by striking the pope's name from their diptychs, and chose of their own accord to share his schism. At first they do not seem to have wanted to do so. John III of Antioch certainly refused to go into schism at Caerularius's bidding. But, eventually, the habit they had acquired of looking to Constantinople for orders proved too strong. The emperor (not Constantine IX, but his successor) was on the side of his patriarch and they had learned too well to consider the emperor as their over-lord in spiritual matters too. Again, it was the usurped authority of Constantinople, the Erastianism of the East that turned a personal quarrel into a great schism. ^ Gallagher, Clarence (2008). The Oxford Handbook of Byzantine Studies. Oxford University Press. p. 596. ISBN 978-0-19-925246-6. ^ "Ecumenical Patriarchate - Holy and Sacred Synod". patriarchate.org. Retrieved 2 July 2017. ^ "Konradsblatte". Konradsblatte. Retrieved 2008-09-07. ^ Cazabonne, Emma (2019-01-15). "Decision of the Constantinople Patriarchate Holy Synod concerning the restoration of its stavropegion in Kyiv". Orthodoxie.com. Retrieved 2019-01-17. ^ Panagiotisandriopoulos (2019-01-12). "Φως Φαναρίου : Η ΑΓΙΑ ΚΑΙ ΙΕΡΑ ΣΥΝΟΔΟΣ ΔΙΟΡΙΣΕ ΕΠΙΚΕΦΑΛΗΣ ΤΟΥ ΠΑΤΡΙΑΡΧΙΚΟΥ ΣΤΑΥΡΟΠΗΓΙΟΥ ΣΤΟ ΚΙΕΒΟ". Φως Φαναρίου. Retrieved 2019-01-12. ^ "Russian Orthodox Church recognizes Patriarch Bartholomew as schismatic". TASS Russian News Agency. 20 October 2018. ^ "Announcement of the Ecumenical Patriarchate of Constantinople". Ecumenical Patriarchate. 11 October 2018. Retrieved 12 October 2018. 1) To renew the decision already made that the Ecumenical Patriarchate proceed to the granting of Autocephaly to the Church of Ukraine. ^ Tomos ante portas: a short guide to Ukrainian church independence. Euromaidan Press. 14 October 2018. Retrieved 16 October 2018. the Synod ... of the Ecumenical Patriarchate ... gave further confirmation that Ukraine is on the path to receiving church independence from Moscow. ... Although President Poroshenko triumphantly announced that in result of the meeting Ukraine had received the long-awaited Tomos, or decree of Church independence – a claim circulated in Ukraine with great enthusiasm, this is not true. ... Constantinople’s decision will benefit other jurisdictions in Ukraine – the UOC KP and UAOC, which will have to effectively dismantle their own administrative structures and set up a new Church, which will receive the Tomos of autocephaly. ... Right now it’s unclear which part of the UOC MP will join the new Church. 10 out of 90 UOC MP bishops signed the appeal for autocephaly to the Ecumenical Patriarch – only 11%. But separate priests could join even if their bishops don’t, says Zuiev. Kursar, Vjeran (2013). "Non-Muslim Communal Divisions and Identities in the Early Modern Ottoman Balkans and the Millet System Theory". Power and Influence in South-Eastern Europe, 16th-19th century. Berlin: LIT Verlag. pp. 97–108. Thomas, John P. (1987). Private Religious Foundations in the Byzantine Empire. Washington, D.C.: Dumbarton Oaks.